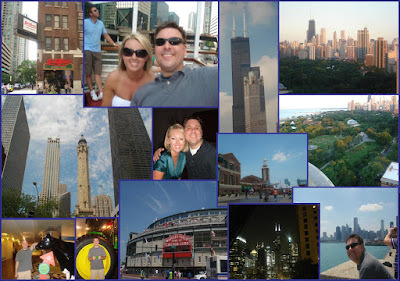 We went to Chicago this past weekend for Tom and Stephanie’s wedding. We took a few days off before did some sightseeing around town. I’ve never been to Chicago before and I absolutely loved it! We drove all night on Wednesday night with Mark and Lane and hit Chicago right at about morning rush hour. We went straight to the zoo in Lincoln Park, which is a great zoo by the way! Then we went downtown to Michigan Avenue and ate at Giordano’s Pizza which is the best deep dish pizza EVER! Then we went to H&M. where apparently I proved my shopping prowess! Then we went back to Lincoln Park to check in to our Hotel. We stayed at the Belden Stratford Hotel which is Fabulous! It’s part hotel and part apartments. We all took a much needed nap!!! Thursday night we went to Tom and Stephanie’s apartment for drinks then out to a club. Friday, those that weren’t in the wedding headed out to Navy Pier and took and architectural tour through the city on a river boat – this was probably my favorite part! We also at the infamous Billy Goat Tavern, where the SNL skit Cheebourger Cheebourger originated. Then we went to the Museum of Science and Industry where Mike was enthralled with the Poop to Power display. By the end of the afternoon, Mike and I were the only ones left in our tour group and we were about a $40 cab ride away from our hotel, so we decided to make and adventure out of public transit. It was much cheaper (about $8 in total) but about twice as long, but we saw parts of the city that we wouldn’t have seen otherwise. Friday night, we went to a great dinner out to celebrate my new job… Kinzie Chophouse – it was wonderful – probably the best steak I’ve ever had. We walked around downtown and headed back to the hotel for some much needed rest. Saturday, Mike and I walked to Wrigley Field and bought t-shirts to prove we were there and headed the 3.6 miles home – we did alot of walking and hailed a cab about halfway back… Saturday night was the wedding – the whole reason we were there… it was so wonderful! The entire affair was at Carnivale, a Cuban restaurant in the downtown area. 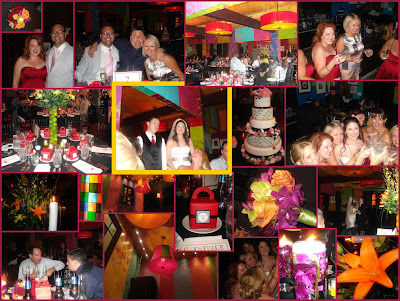 Everything was bright colors and pop art and it really illustrated the creativity and passion of Tom and Stephanie. Stephanie even made her own wedding cake – it was gorgeous! We ate and drank and drank some more and danced the night away. Sunday was a rude awakening in that we had to go back to reality and drive 10 hours back to Fayetteville – it wasn’t too bad – it helps to travel with more than 2 people so that everyone can nap. We made it home safe and sound right about 12:31 – precisely as predicted by Lane. I really loved Chicago! Although I may have other things to say about it had it been the middle of winter. Garage Sale update and notice of Resale Shops NOT to shop at!! !